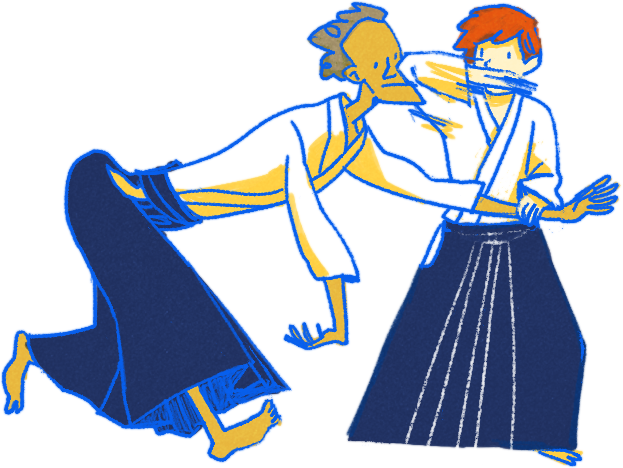 Recently it was Yoko-sensei's 60th birthday and I got to design the commemorative tenugui for Aikido Kyoto. It's inspired by the choju giga scrolls which are very famous, and much loved in Kyoto. I didn't actually see it until the day of the seminar. It was a relief to see it came out pretty much as I designed it. All the members got one, and Yoko-sensei also sent some to all dojos we have a relationship so they've gone to Europe and America too. The remaining tenugui will be on sale for 1000 yen each. The webshop is now open! You can now buy the limited edition Dun Laoghaire pier print and other nice things are coming up soon! Check it out. Also if there's any of my older pieces you'd be interested in having a print of let me know. To all my coffee friends*: Announcing MUGS FOR BEANS: a monthly bit of fun where in exchange for a bag of delicious coffee I will draw a little portrait shot of you. *You don't have to be my friend for real but you should be into coffee to take part. First, if you don't already you'll need to follow me on instagram (@merryko). [Roaster + Coffee Details] is the format. After twenty four hours from the point of posting the competition is closed and I chose a winner. You send me your mug to be drawn (doesn't have to be your own) and I'll send you the postal address. When your coffee gets to me, you'll get your portrait.